Abundant activities and white sand beaches are all close by for an action filled vacation or just relaxing on the beach. Perfect sunsets from the lanai welcome guests to a comfortable Maui paradise. Inquiries welcome. New interior rennovations completed on 10/1/11 New Kitchen cabinets, new countertops, built in micro wave, undercounter wine cooler, completely new bath and all new flooring. Updated Track Kitchen lighting. New bedroom carpeting with super plush padding. New AC in Living area as of April1, 2018. Professional Registerd ER nurse living here on Maui since 1991. I can assist you in many ways to make your Maui vacation enjoyable and convienent. Close personal attention to details. Retired as of 7/31/17. I manage and feel this unit is in the top 5 best rental properties at Maui Vista. My goal is to present a premium location with Wailea quailty here in Kihei. As the owner, I am close by for any needs or assistance with unplanned events. I can help you get connections to activities and guide you in choices to get the most out of your time here on Maui. Steps from Charley Young/Kam 1 beach great for family and friends. Take the beach equipment already provided for an fun day in the sun, even includes coolers and umbrellas!! All local, long distance, 411 information, and ALL CANADIAN calls are complimentary. Internet access is complimentary, unlimited 411 (information) access, no charge for any local or long distance calls, US mainland and all Canadian calls are free. Newly remodeled as of 10/1/11.. new pictures posted 10/9/11. This place is well maintained well decorated. The owner Mr. David is amazing and the house reflects their love of family and attention to detail. Has everything we needed during the time we stay; location is perfect, close to stores and restaurants. We enjoyed very much, left with a treasure trove of cherished memories!! We will come back again for sure! Thank so much Mr. David! I stay in 1304 twice a year, and have been for years now. It is my home away from home! It is always nice to be back!! Thanks Ed. Always glad you come back to my condo. You’ve been the best guest. Thanks so much. Looking forward to seeing you here again next time . We loved every minute of our stay. The condo was super clean, well stocked! 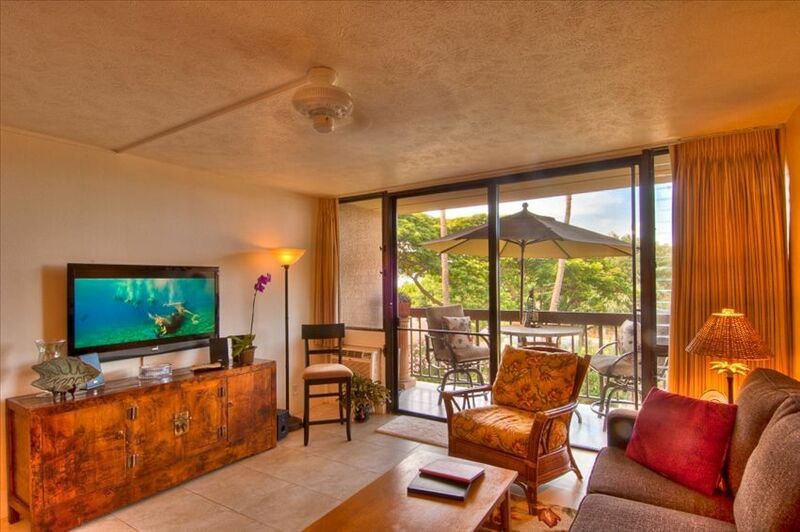 I would totally suggest this condo to anyone wanting to have a relaxing time in Maui. Central to shops, groceries, beaches and restaurants. The condo was amazing and so was David. When we arrived he had the nicest welcome platter and was available for anything we needed. The property was clean, well maintained and very well accommodated. David met us at the condo as soon as we arrived and was very helpful with local restaurant, beach, stores, and activity suggestions. He was very responsive from our initial booking and throughout our stay. The condo was perfectly located and walking distance to many beaches, restaurants and shops. The condo was clean and very well accommodated. It had everything we needed for the beach and for cooking. Would definitely stay again at this condo! Thanks, Kelly. I strive to have each guest feel that their expectations are exceeded. Really enjoyed having you as guests and looking forward to another visit in the future! Great condo and awesome location! I’ve rented this condo twice now and will rent it again if I’m lucky enough to return to Maui! It’s clean and fully stocked with kitchen supplies, beach supplies, towels, liens, everything you need! Parking is ample and on site. You can literally walk across the street to a beautiful beach. Many Restaurants, shops, an ABC store and a grocery store are also within walking distance. The owner was very courteous and helpful throughout the whole process. Hope you can escape to Maui again soon! Glad you found all you needed to be at home in the condo. Thanks again as I want everyone to be comfortable when they choose Maui Vista 1304. Love this place and David ensures a warm welcome and unit is well stocked. Looking forward to next time. Close to the popular Maui Ocean Center, great for the whole family. Designated smoking areas available. Rates subject to change unless reservation is confirmed. Monthly rate of 99.00 offered excluding the Christmas season at 99.00 a night plus cleaning and standard taxes.